Originally, Japanese have been agricultural people, this have had a profound influence on the culture and the way of living, thinking and behavior. Farming must not be done by oneself, cooperation is needed especially at the settlement level. 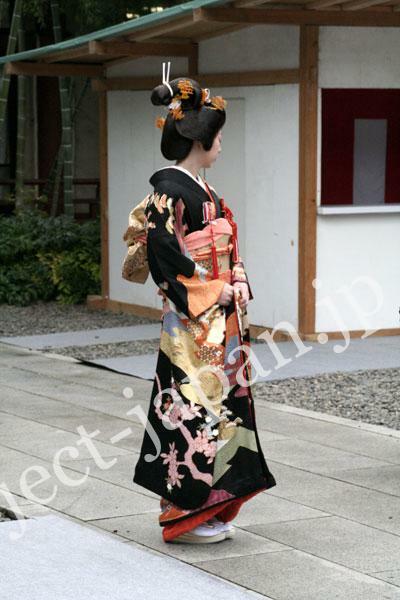 This aspect is connected to the Japanese people’s character of group behavior. Consequently, we don’t like to spawn a conflict basically, and it is considered good to live getting on with each other. But this character is assumed to be indecisive by foreign people sometimes. Nonetheless, there might be a tendency to be unfriendly against the outsider. A group harmony is considered good, there is a tendency to dislike a person who outstand alone. Japanese people’s climate can be said to be shy and discreet, but lacking of individuality, to give it a harder name. This tendency can contribute to a few response in a class when a teacher asks a question to his students or in a concert venue when musicians say something to their audience (in this case, there is a possibility that they don’t understand English well…). If you are annoyed by the Japanese character, remember this background, or you may get some key to understand it. Agriculture is the very base of living, nature is closely relevant to the Japanese way of life. Man is viewed as a part of nature. Gods who govern nature such as the sea, the mountains, the river etc. have been imagined to exist and been the subject of worship. Plenty of words explaining nature thing are used in the names of family name or places, and the family crest. In surnames, “yama” (mountain), “kawa” (river), “mura” (village), “ta”(rice field) etc, are frequently used, and the name of plants such as “fuji” (wisteria), “sakura” (cherry), “ume” (Japanese plum) etc. are also shown up. Names have its meaning almost always. For example, a family name “Yamada” have a meaning of “paddy fields in mountain ravines”. If you have some Japanese friends, it maybe be fun to ask the meaning of their name. As for the family crest, in comparison with the animal motifs used in the Western countries, many plants are used in Japan. Generally, Japanese profess gods and Buddha equally. 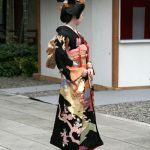 One of the reason can be the birth-myth of a nation that some gods had created Japan has been handed down from generation to generation since ancient times, people have been thinking that each of the nature things such as the sun, the sea, the mountain etc. has each god. Also, the teachings of Buddhism has been pervasive and deeply embedded alongside. So, a great number of temples enshrining Buddha and shrines with the gods have been existing without conflict. Each god, Buddha, Amitabha Tathagata or Deity of Mercy is a guardian deity blessing in some region, such as bringing through people of disease, road safety, the welfare of the household, scholarship, a safe delivery etc. 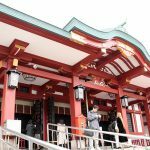 Many people go and worship at both of temple and shrine, and above all, the new year’s visit to worship is called “Hatsumode” and it is a big event all over the country. Other guardians are seen by the roadside. They are guardians deity of children (called “Jizo”, or “Ojizo-sama” in more polite way) or guardians for the community (called “Dososhin”) . 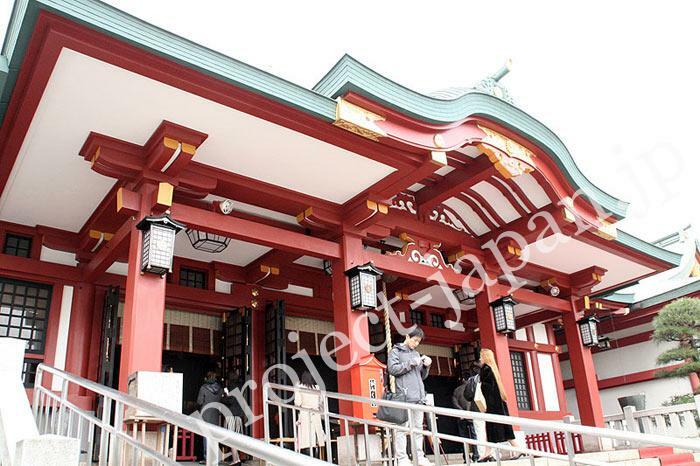 And you can see many shrines as well as temples almost everywhere in Japan. 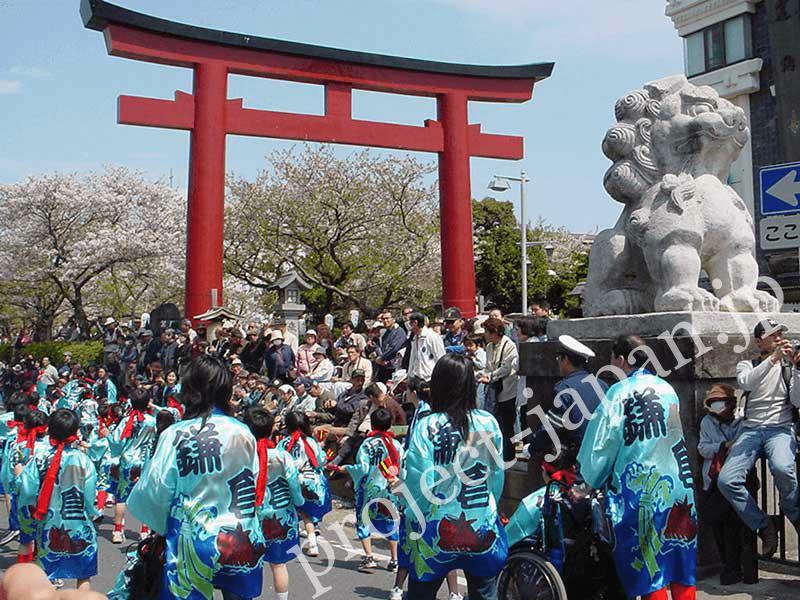 Hiejinja (Chiyoda-ku, Tokyo) enshrines God named Ohyamakuhinokami who governs water, fire and the earth. 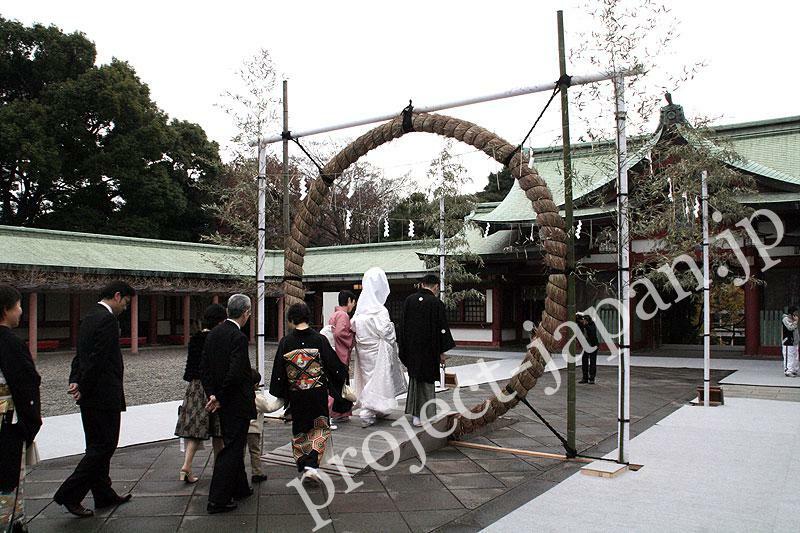 Chinowa is a large ring made of a kind of thatch. People purify themselvs by walking under it every six months. 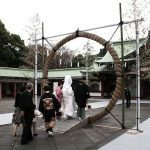 (the last day of June and December) A couple who got a wedding at this shrine and their family also walked under Chinowa.